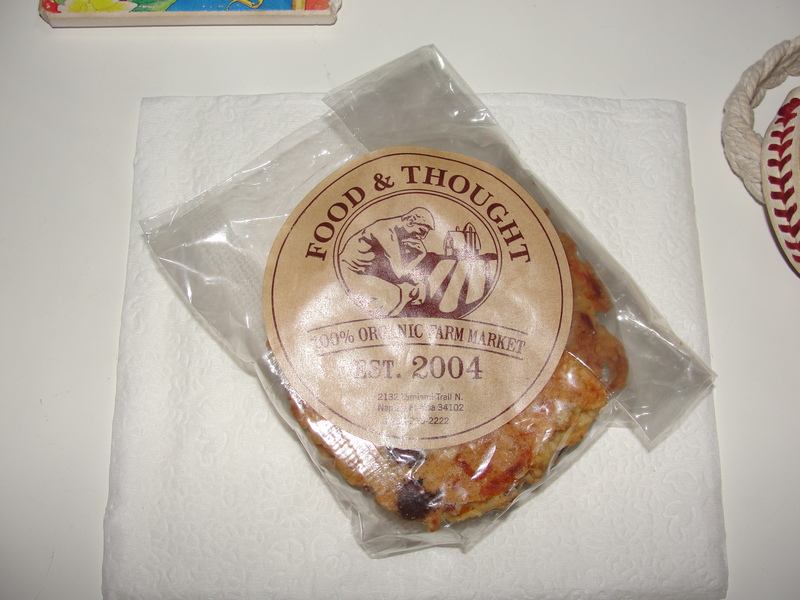 Located in this grand city of Naples, Florida is a market/restaurant called Food and Thought. F&T offers a variety of Organic items in both market and restaurant form. Even though I am a Neapolitan, I can say that I have never visited F&T. Why you ask? Well, no reason really. I just simply never have gone. I have also never had an item from either the market or restaurant. That was until I tried my first item last week – a cookie. Acquired via my boss at work, I was excited to not only try this cookie but, write the review to follow. Now, this cookie contained no description as to what kind it was. 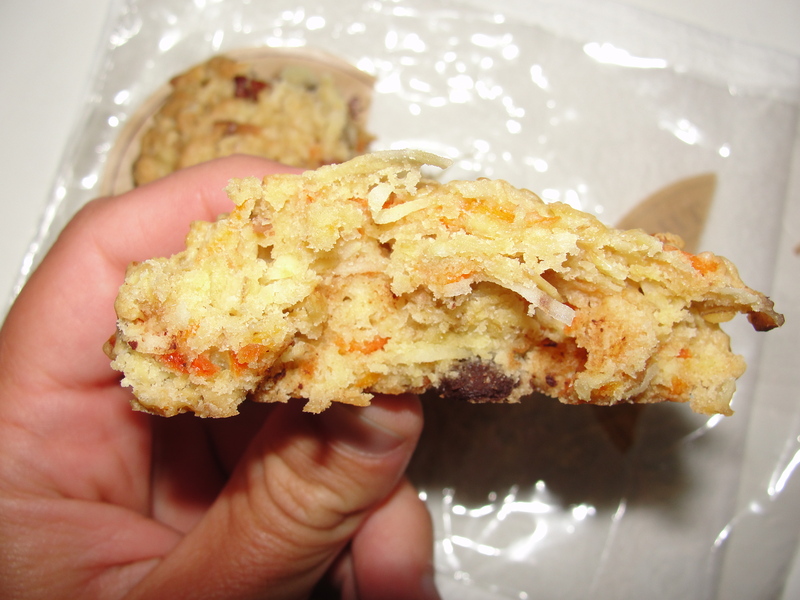 At first look, I could see shredded pieces of carrots, a white shredded substance, walnuts and chocolate chips. And, it looked somewhat oaty. I don’t recall ever having a cookie before that contained carrot pieces. I was quite intrigued and brought the cookie home to try. I removed this cookie from the plastic wrap and examined it more closely. It was very heavy, moist and did not have any strong smells. I broke the cookie into a few pieces and examining the cross-section, I received confirmation of the elements I was expecting. 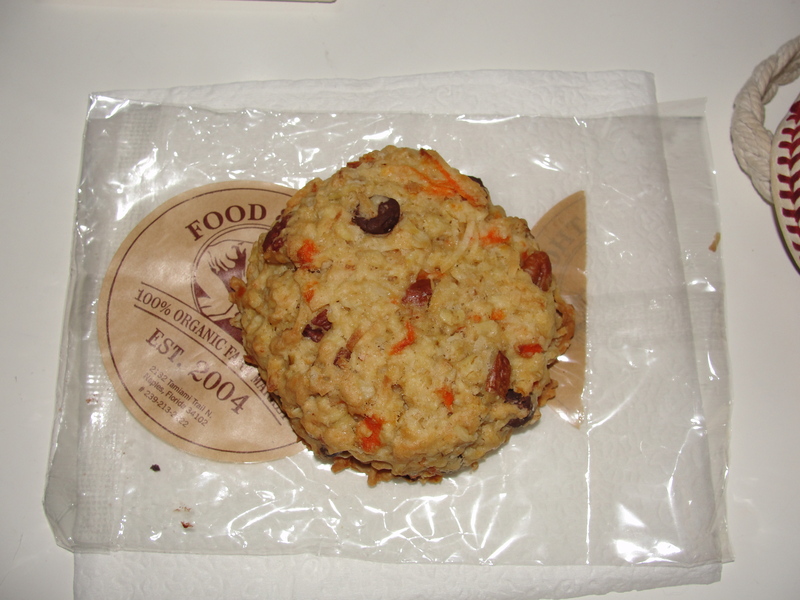 I observed shredded pieces of carrots, coconut, oats, walnuts and chocolate chips – very interesting. Going into the first bite, I was totally blind and had absolutely no idea what to expect. Carrots? Really? I bit the bullet and placed that first piece in my mouth. Whatever my inner-self was expecting to taste, was totally not what I tasted. The first bite I had did not contain any chocolate chips or walnuts. The best way to describe it was weird. The consistency of this cookie was unlike anything I have ever had before. I could feel the shredded pieces within my mouth as I was chewing the cookie. While it was indeed very moist, I felt as if the cookie itself was also very dry. As I continued to eat the cookie, and had pieces with walnuts and/or chocolate chips, the dryness was quite improved. Moist and dry at the same time really baffled me. I continued to eat the cookie and found myself having a problem deciding if I liked it or not. Even though I could taste the shredded pieces of carrots & coconut, I did not feel as if the cookie itself really tasted like this. 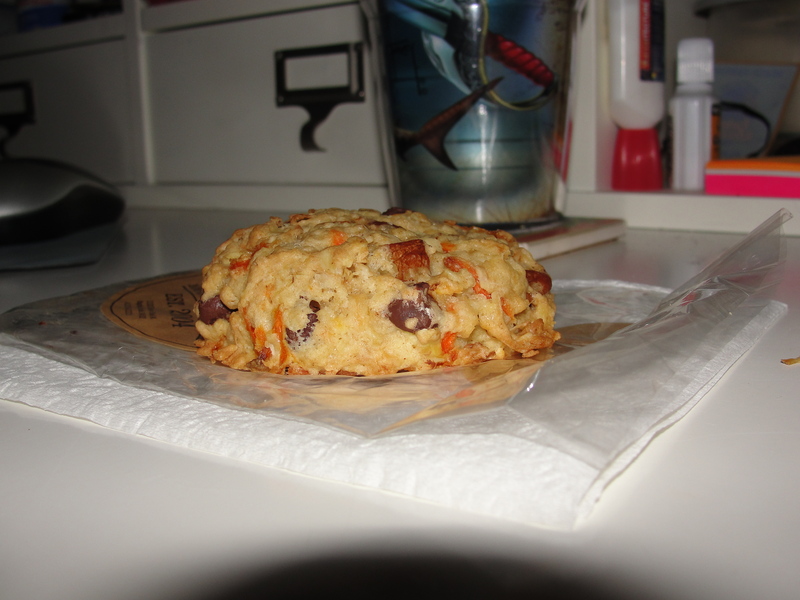 There were some oats visible yet, the cookie didn’t really taste like oats either. The only flavor I could really taste from the visible ingredients was the chocolate chips. The chips were of the semi-sweet variety, soft and chewy. The bites containing the chocolate chips, provided me with bursts of flavor over a rather unflavored cookie. I did also get some flavors from the walnuts. While the walnuts were not very crunchy, I could taste the familiar solid taste of them. There were no flavors of sugar or spices at all from this cookie. I can say hands down, that I have never experienced this phoneme with any cookie I have ever had before. Odd? Well of course it was odd. Still, I had no problem eating this entire cookie constantly searching for the missing flavors. Did I find them? No I did not. Food for Thought this was indeed. Even though this cookie had no real flavors to speak of, aside from the walnuts & chocolate chips, at least it did not have strange flavors that I could not place. I could taste the consistency of the ingredients just not their taste. Would I have picked out this cookie on my own? Well, probably not. But, I am glad that I got to try it. Even though there were no real flavors to speak of, this cookie was not all that bad. I will never have to have one again, but the missing flavors have left me with an unsolved riddle. At least I got my Food for Thought from the place simply known as, Food and Thought.